Are you a chocolate-lover? You are going to LOVE this scrumptious homemade chocolate french toast recipe using Hershey’s Simply 5 chocolate syrup! This is a sponsored post on behalf of Hershey’s via MomTrends. I don’t know about you, but my entire family looooooves chocolate. I look for any occasion to celebrate a little by adding it in a little here and there for my kids, wouldn’t you? Hey kids, who wants chocolate chip pancakes for breakfast?! Or a little delicious chocolate swirled into their breakfast oatmeal, mmm! I think it stems from my hearty love of chocolate when I was a small child – lovingly drizzling that delicious Hershey’s Syrup into my milk with my swizzle straw (remember those?) and slurping to my child heart’s content. I could NOT be more pleased to share with you the brand new Hershey’s Simply 5 Syrup – it tastes just like the classic syrup, but even sweeter with just five simple ingredients. Let your kids squeeze to their heart’s content with no high-fructose corn syrup or artificial ingredients, plus it’s gluten-free and made with non-GMO ingredients. Hooray! I decided to sweeten my children’s day by starting it off in a sweet way – with Chocolate French Toast! French toast is always a huge hit in my home, but with Hershey’s Simply 5 Syrup, it just became that much better! I decided to make the French toast mixture more cake batter-esque but you could certainly go with regular or whole milk instead. Gooooosh, drizzling that Hershey’s Simply 5 Syrup into that cream and egg mixture just brought back ALL the memories of my childhood, and it made me actually GIDDY to make for my kids! So so much fun! Once mixed, it resembles a beautiful and thick chocolate milk mixture, ready for the bread! You could use any bread in this, but we prefer a honey wheat. It’s nice and spongy, all-natural ingredients, and fries up real nice as French toast. See how beautiful and luscious that chocolate milk egg mixture is? It’s ready for the griddle! I’m a firm believer in spraying first, then buttering after. I like my French toast (and pancakes) to be golden brown with a hint of butter on your lips from the crusty edges. I use a tiny baster to do the trick. Ohh, mama.. if only this computer or phone screen were scratch and sniff, you’d be in HEAVEN right about now! The chocolate wafting up from the griddle with each delicious sizzle. Powdered sugar is a must here, don’t you think? I mean, it’s completely optional and totally up to you, but c’mon, it’s like peas and carrots. So so good, not too over the top, and it looks fancy! 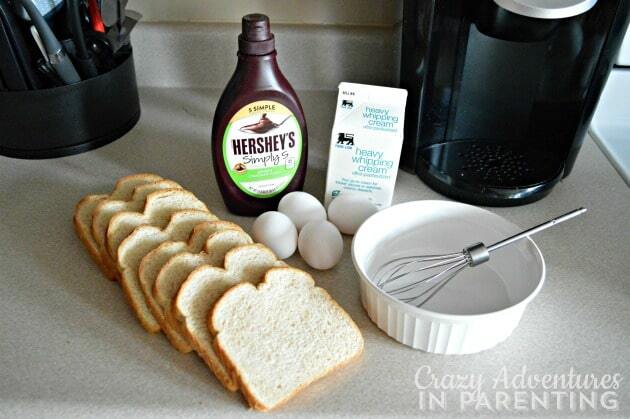 G’head, make your kids’ day by drizzling some additional Hershey’s Simply 5 Syrup over top. A little goes a long way here! Finally, add in your maple syrup, as you normally would. Since you’ve added the Hershey’s Simply 5 Syrup, though, you might not want to add too much, they will blend just nicely together over those fantastic steaming pieces of French toast! Using the new Hershey's Simply 5 Syrup, Lisa's transformed a normal french toast into something even MORE fantastic and celebration-worthy! Whisk together your four eggs, then add in the cream (or milk); beat well. Drizzle in the Hershey's Simply 5 Syrup (and optional vanilla) until fully blended. Heat your skillet - coat with cooking spray and baste it with butter. Adding one piece of bread of a time, coating each side, and place carefully on your skillet; repeat with other slices of bread until skillet is full. After a few minutes, flip over each piece of French toast until crisp on the outside and firm and not too soft on the inside - will look golden brown. Shake some powdered sugar over each finished slices of French toast. Drizzle Hershey's Simply 5 Syrup over top along with maple syrup. My kids loooooved their special chocolate French toast made with the new Hershey’s Simply 5 Syrup. Look at my daughter’s face! NOM NOM NOM! Haha! Hershey’s Simply 5 Syrup is available in 21.8oz bottles at mass and grocery retailers, and will be available in 48oz bottles at Costco starting this spring – yeah, baby! Visit www.Hersheys.com for more information, or follow them on social on Twitter, Facebook, YouTube, or Instagram. In the hustle and bustle of everyday life, making time for traditions can sure seem daunting, but it doesn’t have to be! Some of the best moments are the simplest ones! How do you help make your family’s day sweet? Take a moment to “stop and smell the chocolate” and share with us your “Simply 5” – a five word recount of what makes your day sweet, using hashtag #Simply5 on social media. Compensation was provided by Hershey’s via MomTrends. The opinions expressed herein are those of the author and are not indicative of the opinions of Hershey’s or Momtrends.